It was barely Halloween of last year, and white flakes were already dusting the hills of Killington, Vermont. Just when the skiers thought it was safe to go back into the snow, guitarist Ritchie Blackmore and his four-man rock squad, Rainbow, arrived at Summit Lodge for two weeks of maneuvers. In a cabin down the road from the main lodge, the band set up its banks of music gear and cranked the volume to the threshold of pain. The walls and snow muffled the din to the ears of all but a few passing skiers and some rats in the rafters. "The location suited me," says Blackmore, an inveterate night crawler who likes to hold seances in drafty old houses. "There were mice running everywhere, and the band sipped wine around the fireplace." By the second week of November, the group had more than enough material for four new desired tracks; they took a brief break before continuing to Quebec where the writing was completed. The results of all the work are shaping up as Ritchie Blackmore's most popular disk in America since his Deep Purple days. Ritchie, Roger Glover, Joe Lynn Turner, drummer Bobby Rondinelli and organist David Rosenthal put six weeks' recording and 10 days' digital mixing into the Polydor Records project. The care they took gives Straight Between the Eyes a cleaner sound than that of any previous Rainbow album. "If I had Rainbow to do over again," Blackmore explains in a near-whisper on the phone from Quebec, "I'd have more of the band that I have now. The overall sound of Rainbow is coming out better on this album," he admits - reluctantly, for until he took the trip to Canada and added New Jersey native Rosenthal to the group, Ritchie, who's still a British citizen, had always insisted upon making records in Europe, showing more concern for his own sound preferences than for radio play in America. The inclusion of the cool, lyrical "Stone Cold" in Straight Between the Eyes is proof that the formerly rough-edged Rainbow can turn out a stateside single as deftly as Foreigner can. "Ritchie's not just the heavy-metal maniac everyone thinks he is," contends singer Joey Turner, whose voice has an adaptability to ballads that his predecessors in Rainbow like Ronnie James Dio have lacked. "Blackmore knows exactly what he's looking for within the band at any particular time." 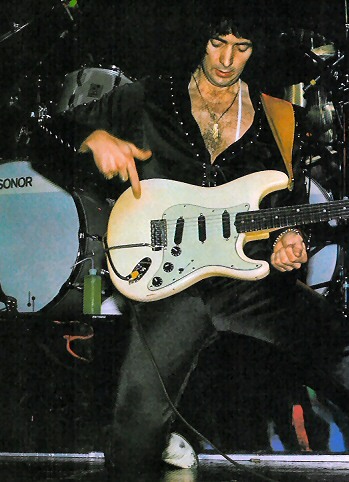 The glint in Ritchie Blackmore's eyes as he glides into a dim Manhattan bar could be mistaken for the expression of a maniac. Dressed completely in black except for a zippered white leather jacket, the dark-haired guitarist has little of the composure in his aquiline features that his self-assured walk would seem to promise. "Traffic!" he says angrily, explaining his delay in arriving from Weiss Heim, his white house on Long Island, New York. At 37, Richard Hugh Blackmore comes closest of all the ex-member of Purple to embodying the flamboyant, temperamental spirit of that band. Ritchie was jailed in Vienna for breaking a concert security cop's jaw. Twice divorced, Blackmore married former New Yorker Amy Rothman last May 16, but he's still eagerly sought by groupies. He consumes both wine and Scotch in large quantities. He says he prefers classical music, especially Bach, to most rock & roll. He's stormed off stage in mid-performance and hidden behind the amps because he was dissatisfied with the sound system. He's landed in fights with bartenders and bandmember alike. He's ridden in a Jaguar through the doors of a posh European hotel, but has never learned to drive. Born in Middlesex, England on April 14, 1945, Ritchie Blackmore grew up in Heston and began playing guitar when he was 11. "It started as a hobby," he maintains, "and it's been a hobby ever since." At 13 Blackmore took lessons from British guitar ace Jim Sullivan, and by the time he was 17 he found himself touring Europe with Gene Vincent. Stints followed with the Three Musketeers and with the Outlaws, a European group that also boasted Jimmy Page as a member. Blackmore crossed Germany, Sweden and Denmark with Screaming Lord Stitch and the Savages from '64 until '66. After some time spent away from music in Germany, where he "lived off immoral earnings," he returned to England in '68 to form Deep Purple, the band that put the "metal" into heavy metal. Seven years ago, he left Purple and founded Rainbow. He moved to America and he hasn't looked back since. "Deep Purple was just lucky," he now contends. Regardless of what's been going on in his well-publicized private life , Blackmore has managed to produce an impressive string of hard-rock albums, and he's done so despite enough personnel problems to make an unsettled band such as Genesis look like a pillar of stability. "It's not that I'm seeking perfection," claims Ritchie. "I'm just looking for an affinity in the musicians I hire toward the way I feel about certain things. " The biggest defection ever to rock Blackmore's boat nearly put an end to the guitarist's sociable intentions, however, and not until Straight Between the Eyes did his group get its sea legs again. The walkout took place after Rainbow finished the Down to Earth tour in 1980, whereupon drummer Cozy Powell, singer Graham Bonnet and keysman Don Airey, who were all friends, dropped one by one from Rainbow's ranks. Only Blackmore and bassist Roger Glover, Ritchie's partner from Deep Purple, survived the upheaval. 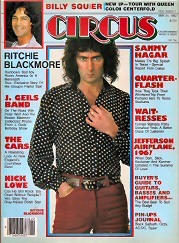 Until now, Blackmore's been reluctant to explain what happened. With the record company promoting his new LP heavily enough to ensure the continuation of Rainbow, the bandleader has decided to take the lid off the Rainbow purge. "Nobody's ever left this group without being asked to leave," says Blackmore matter-of-factly- "If I really wanted someone to stay in the band, I'd keep a rapport with that person and say, 'We can work this out.' Those people who've left-there's always been a reason." The ex-members of Rainbow haven't always agreed with their former boss about those reasons. "I felt I'd done everything that I could with Rainbow," Don Airey says diplomatically. Airey, whose 'last LP with Blackmore was Difficult to Cure, is now playing keyboards with Ozzy Osbourne. "I blame myself," he continues, "for not doing more to keep Cozy in the band. The lineup we had at the time of Down to Earth [1979-'80] had a hard, English style. I think we could have been another Led Zeppelin if we'd stayed together." Airey was never officially fired, nor did he tell Rainbow he was quitting. When it became apparent to Ritchie, however, that Don wanted to stay at home in England through the fall of '81, he held auditions in Babylon, Long Island. The player who won, Berklee School of Music alumnus Dave Rosenthal, was hired the last week of October. "The band's seemed more cohesive ever since Dave joined," says Joe Lynn Turner. "Of course, nobody can expect to be with Rainbow forever and ever, including me. But I'm going to give it all I can for now. The attitude that no one will last hurt Don. He thought Ritchie was breaking up the band; that he was grasping at straws, not knowing what he was doing." "Don was Cozy's best friend," Ritchie continues. "He didn't know that I had got Bobby Rondinelli to replace Cozy, and when he found out, he was fuming. I know Don's a good keyboard player; he's a musician's musician. But Don and I never spoke. It was a very tense situation. I can't blame him for taking that position about Rainbow; Don's not used to temperamental people like me. But it got to the point where I wanted Don out of the band." In late November the realigned rock outfit traveled to Morin Heights, Canada, to lay down the tracks for Straight Between the Eyes. Released April 12, just in time for Blackmore's birthday, the album features nine tightly-arranged numbers. The uptempo "Miss Mistreated," the hypnotic "Tight Squeeze" and the lilting "Stone Cold " are standouts. Blackmore, always a master of the guitar, plays with the fire of the young Jimmy Page throughout "Dream Chaser." The record is being supported by an exhaustive tour that stretches from May to November. Taking the group from North America to Japan and Europe, the global jaunt includes markets new to Blackmore in Spain and Portugal. At whistle stops like the L.A. Forum, the Japanese Budokan and other halls that Rainbow consistently sells out, the band plans to go to town on the visuals with a backdrop featuring two giant eyes, orbs that burn with searing light during "Eyes of Fire" and "Death Alley Driver," two of Blackmore's new favorites. "Though I hate to record, I enjoy performing live," explains Blackmore, more relaxed in the bar after a few glasses of coke and Johnny Walker Black Label Scotch. "I'm usually very drunk when I play," he confides. "Part of me is shy, and I have to drink a lot to come out of myself. I do stay in control; I just like to have a good time playing. "But I don't like to glamorize everything," he says firmly. "I don't even like to do too many theatrics. Of course, it wouldn't work for us to go out with lutes and play Elizabethan melodies, as much as we might be tempted to. We have to put on a show. But all I do on the guitar is to emulate classical violin, which takes from sixteenth- and seventeenth-century organ music. The orgall is so commanding - as opposed to guitar, just whimpering along," says Blackmore unexpectedly of his own instrument. If keyboards are so important in Rainbow's music, then, why hasn't Blackmore put more effort into establishing a rapport with players like Airey, who he admits is a real talent? And will he be able to keep newcomer Dave Rosenthal in the band? "Unfortunately for Don," says Blackmore, "and for Dave, too, I'm a guitarist who likes to take a lot of leads and introductions. At the same time, I won't put up with someone who's second rate on organ. That's why I go through so many band members. I have to have the best players available," he concludes with the ghost of a smile; "ones who will sit back and listen to me play!"